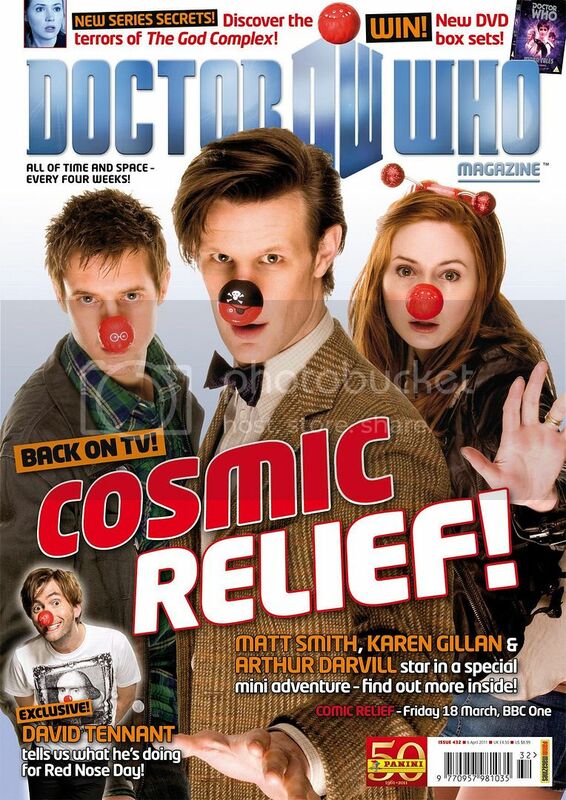 The latest issue of Doctor Who Magazine delves into this year's Comic Relief, with news of a special Red Nose-themed mini-adventure for the current TARDIS crew, plus in a new interview with David Tennant in which he reveals how he's getting funny for money. Curb Your Enthusiasm: Doctor Who’s head writer and executive producer, Steven Moffat, reveals what his predecessor, Russell T Davies, has recently been emailing him about in PRODUCTION NOTES! Men Behaving Badly: The Watcher proudly presents the ultimate guide to the Doctor’s arch-nemesis! Discover the secrets of every secret identity, every cunning disguise and every sinister incarnation of the Doctor’s most persistent foe in THE WATCHER’S GUIDE TO THE MASTER! Gimme Gimme Gimme: Will one man’s greed cause the destruction of the human race? Find out, as THE FACT OF FICTION puts the colourful 1971 Third Doctor adventure The Claws of Axos under the microscope! One Foot in the Grave: Amy dons a nurse’s outfit as she and the Doctor investigate a series of mysterious disappearances at an old folks’ home. But what lurks in the laundry closet? And who are the faceless children who come visiting after dark? Find out in a new comic strip, DO NOT GO GENTLE INTO THAT GOOD NIGHT, by Jonathan Morris with art by David A Roach! Till Death Us Do Part: THE TIME TEAM unearth a curious tale of zombies and Charles Dickens, as their continuing mission leads them to Victorian Cardiff for the Ninth Doctor adventure The Unquiet Dead! Just Good Friends: Should Doctor Who celebrate its continuity? Or is it better to break with the past and have all-new adventures? DWM sparring partners, Toby Hadoke and Johnny Candon confront the controversy in A BATTLE OF WITS! As Time Goes By: The much-anticipated fourth series of the Doctor Who audio spin-off, GALLIFREY, is out this month! DWM talks to the people responsible for the continuing adventures of Romana, Leela and K9, including Louise Jameson, Gary Russell and Scott Handcock. Extras: A History of Doctor Who in a 100 Objects, The Six Faces of Delusion, Supporting Artist of the Month and much more – revel in the madness in the latest WOTCHA! Plus, all the latest official news, previews, reviews, competitions, another prize-winning crossword, and much, much more! Doctor Who Magazine 432 is on the shelves from Thursday 10th March.